Well over one half of our reserves are in the form of coal and lignite which together account for an even larger share of resources. Renewable energy is abundant and – in the case of wind, solar and geothermal – practically inexhaustible, although much harder to quantify as a resource since converting it into useful energy can be inefficient and expensive. We are not about to run out of energy: the world has sufficient energy reserves of all types for the next 80 years and resources to last over one thousand years. Coal and lignite reserves are sufficient for over one hundred years at current rates of production. Unlike oil and gas, coal is widely distributed around the world with particularly large reserves in the USA, Russia and China. For this reason, coal offers a much higher level of supply security: most coal is used in the country of extraction. Where there is an indigenous source of coal, supply security is self-evident. 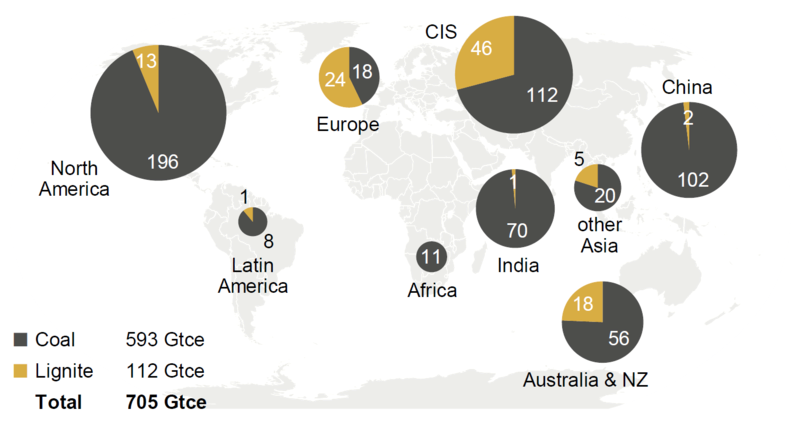 Where coal is imported, supply is supported by a competitive market and a well-developed infrastructure. At around 3%, the European Union’s share of global energy reserves and resources is rather small. As at the global level, it is the EU’s reserves and resources of coal and lignite that are most significant: together they account for 94% of the EU’s remaining potential. Some coal deposits lie near consumers and can be exploited under very favourable conditions. For example, surface-mined lignite in Bulgaria, the Czech Republic, Germany, Greece, Hungary, Poland and Romania is used mainly for power generation, often transported to power plants over short distances by conveyor belt to produce some of the lowest-cost electricity in Europe. Hard coal, both indigenously produced and imported, is much less expensive than imported oil or gas and the majority of EU member states enjoy the benefits of competitive coal-fired electricity generation. Global consumption of commercial energy, excluding non-commercial firewood, dung and other waste, totalled 19 billion tonnes of coal equivalent (Gtce) in 2015. 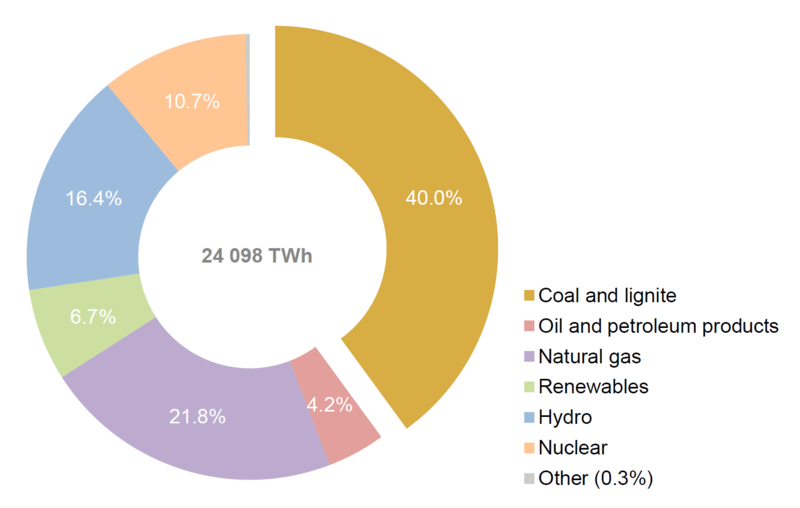 Coal, with a 29% share, ranked second after oil as one of the major sources of primary energy. Coal production has more than doubled since 1980. For power generation, coal plays a major role in both developed and emerging economies. 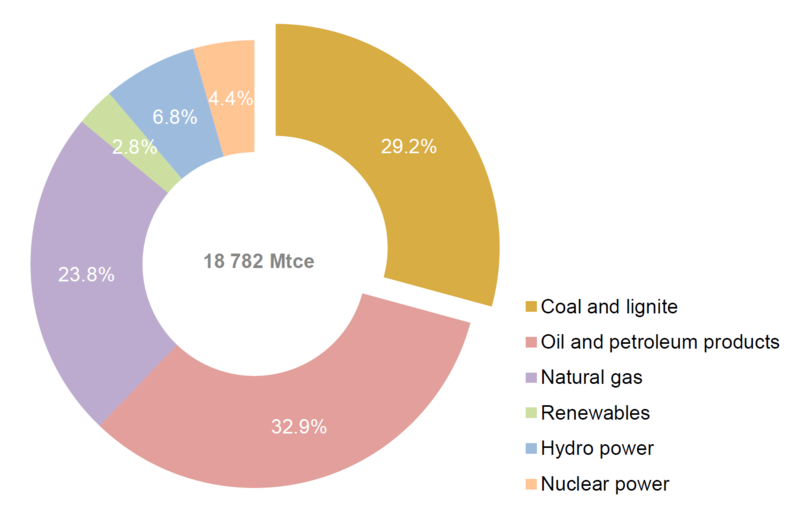 In 2015, 40% of global power generation was based on coal: 37% hard coal and 3% lignite. World coal production reached 7.7 billion tonnes in 2015: 6.9 billion tonnes of hard coal and 0.8 billion tonnes of lignite. In turn, the production of hard coal comprised 5.8 billion tonnes of steam coal and 1.1 billon tonnes of coking coal. Since the turn of the new millennium, from 2000 to 2014, coal use has grown more strongly than any other primary energy source, by 2.3 Gtce in absolute terms, helping to meet a 5.2 Gtce or 36% growth in overall energy demand (World Energy Outlook 2016, IEA, pp.61 & 64). In 2015, total coal consumption slightly decreased, mainly due to changes in China and the United States. New renewables, such as wind, solar and geothermal, have also grown quickly, by 200% or 0.2 Gtce. However, in absolute terms, their contribution remains rather limited, amounting to just 1.3% of worldwide primary energy consumption in 2014. See Coal industry across Europe for more on coal production and use. In short, although shunned in the European Union, coal is an appreciated energy resource worldwide that continues to grow and provide energy for billions of people.